According to Swami Sivananda one can achieve perfect health by the practicing these three asanas: Headstand, Shoulder Stand and Forward Bend. Though there are several other asanas that you may be practicing in your regular class, I would like to focus on these three to start with. The Headstand is referred to as the ‘king of the asanas’ and hence is one of the most powerful asanas for the mind and body. Mastering a headstand can be intimidating but if you could let go of your fears and believe that you can do it, you’ll probably one day just get into it with ease. The Headstand brings oxygen rich blood to the heart and the circulatory system and gives the heart a rest since it has to always work against gravity to bring blood to the heart. It slows down respiration and the heartbeat, therefore making the respiratory and the circulatory system strong. The brain, spinal cord and sympathetic nervous system are supplied with an increased flow of blood rich nutrients. Inverting the body enhances deep breathing, and brings oxygen rich blood to the brain. The mind will be calmed with increased control of ones emotions and self-confidence will improve and you will have more empathy for others. 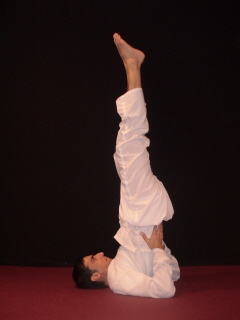 ‘Sarva’ means ‘all’ and ‘Ang’ means ‘body-parts’ and hence the Shoulderstand engages all body parts. The meaning in itself tells you how important it is to bring this asana in your regular practice. One of the most important benefit of the Shoulderstand is that it strengthens and balances the thyroid gland. It brings your weight (both under or over) in balance. Since the chin is pressing in the throat, a rich blood supply is brought to this region and hence regulates the heart, helps reduce high blood pressure and slows breathing. As the flow of blood to the head is restricted for a short period of time when in the asana, it can reduce headaches and many inflammatory problems. Shoulderstand relieves mental sluggishness and lethargy. It brings independence, self control and helps to cure insomnia and depression. On a day-to-day basis, we spend hours in an upright position, seated probably for several hours in front of our computers. This compresses the spine. This is a great asana since it elongates the spine and makes the joints mobile. In this posture the body is bend almost in half, providing a deep strength for the entire spine – from the scalp to the heels. The internal organs especially the digestive systems are toned and massaged leading to improved digestion and a regular practice of this asana combats constipation. The nervous system is invigorated and the spine is elongated which leads to a youthful body. The mind is calmed and relaxed.